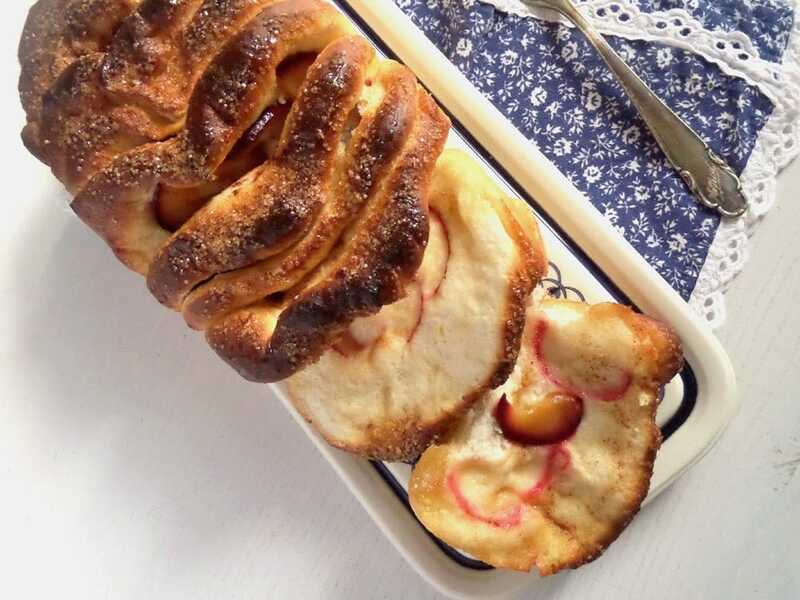 A perfect pull apart bread with plums and cinnamons: soft and fluffy, sweet and full of flavor, this plum bread is a new favorite for us. I don’t really know how I came to make this plum pull apart bread. Actually I was searching for something quicker and involving less work, but then I got tangled in Pinterest again and suddenly there was nothing else I wanted to make than a pull apart bread. I have never made one before and was not sure about the best way to build the bread. After reading a few recipes and not understanding exactly what I was supposed to do (I realize now I should have tried You Tube, but somehow I never have the patience to watch an entire video and some of the voices are soooo annoying! ), I decided to just start and see how it goes along the way. And it went remarkably well, much easier than I had thought. I cannot really give a source for this pull apart bread, as my recipe is a combination of many. I read something here and something there, I thought a few other things necessary or unnecessary and in the end I came up with my own version. The plum pull apart bread was baked and then eaten warm, I just took some time for the pics and half an hour later the last piece was gone. Mind you, it was not a particularly large bread, but still there were only 3 adults and 2 children present. It was absolutely delicious, soft and sweet with tangy plums. The plums were in this case the perfect choice, as we had many of them in the house, this is their season anyway, but I would love to try this bread with cherries next summer. Or peaches. I am in a pull apart bread phase right now, I am already planning the next one, so if you have any REALLY good recipe, please let me know. Mix the flour, salt and sugar together. If you use dry active yeast, mix it with the flour as well. If you use fresh yeast, dissolve it in the lukewarm water first, then pour this mixture over the flour mixture. Add the egg to the mixture in the bowl and knead the dough in the food processor or with a hand-held mixer with kneading attachments until the dough is smooth and doesn't stick anymore. Add a little more flour if the dough is too sticky or a little bit more water if the dough is too though. Knead the dough briefly on the working surface then place the dough in a bowl, cover with a clean kitchen towel and let rise in a warm place for about half an hour or until double in size. Butter a loaf pan (about 23 cm/ 9 inches) if you are using a normal one. You don't need to butter it if using a silicon one. Halve the plums and slice the halves very thinly. Mix 50 g soft butter with 2 tablespoons of the brown sugar. Knead the dough shortly on the working surface. Divide the dough into equal sized balls, about as large as a golf ball. I had 14 of them. Roll each ball into an oval slice (you can lightly flour the working surface if you find it necessary, I didn't need to). Spread a little of the butter-sugar mixture on each slice, place a few plum slices on top and sprinkle with some cinnamon. Spread some butter-sugar mixture on the last one as well, but do not add plums anymore. 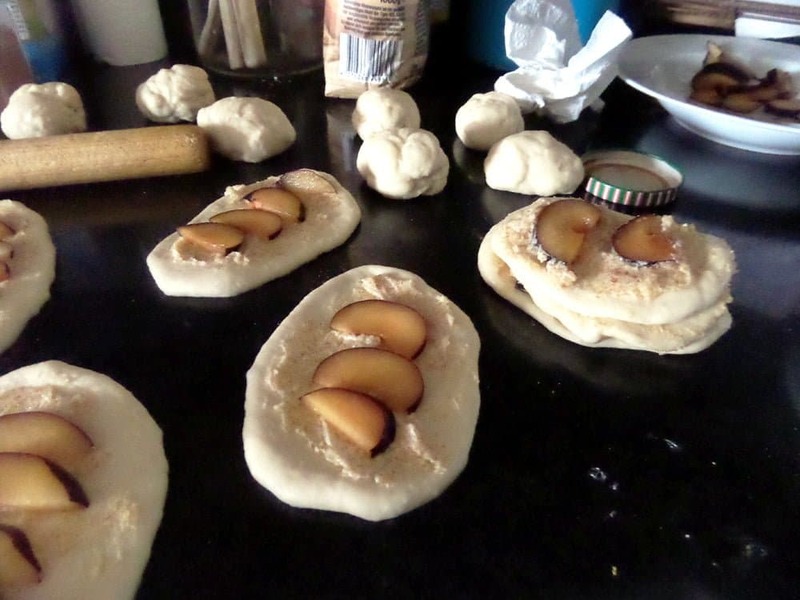 Stack about 3 slices of dough over each other, leaving the one without the plums aside. When all of them are stacked into small groups, take one group at a time and place it in the buttered loaf pan, the way you would put books in a bookshelf. Close the row with the plum-free slice, the buttered side should face the previous slice. Cover the pan with the kitchen towel and let rise again for about 20-30 minutes, until visibly risen. While the bread rises, preheat the oven to 170 degrees Celsius/ 340 degrees Fahrenheit. When the bread has risen, melt the remaining butter and pour evenly on the bread. Sprinkle with the extra tablespoon of brown sugar and with some more cinnamon. Bake for about 25 to 30 minutes until the bread is cooked through but still soft. It should be nicely browned as well. Check the bread after the half of the baking time, if it gets dark too soon, place a baking tray between the bread and the upper source of heat in your oven. Wow! 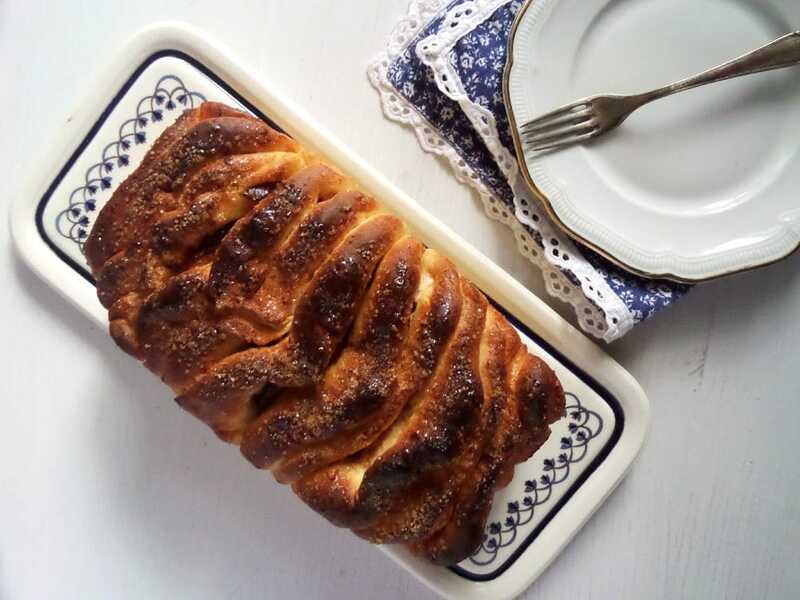 This plum pull apart bread looks completely divine, Adina. I can imagine how soft, sweet and tangy plums must have added an flavor taste.Just so good! This is a beautiful loaf of bread and now you have me craving it too! Oh man, my mouth is watering just thinking about this bread! I, too, have never made a pull apart bread, but I keep telling myself I have to take the plunge one of these days. I wouldn’t have thought to add fresh fruit to the bread, but the addition of plums sounds so, so good! I haven’t found any ripe plums around here yet this year, but when I do, this bread is on my list! Do give it a try, you’ll love it. And it’s easier to make as one would think. If you can’t get plums, try it with peaches, I would love to know how that tastes. LOL You weren’t kidding about pull apart breads! My mom would go insane over this, she loves plums. I’ll just have to make this for her! No kidding here, I really love them, the pull apart breads 🙂 🙂 Your mother will love this one too, I am sure. 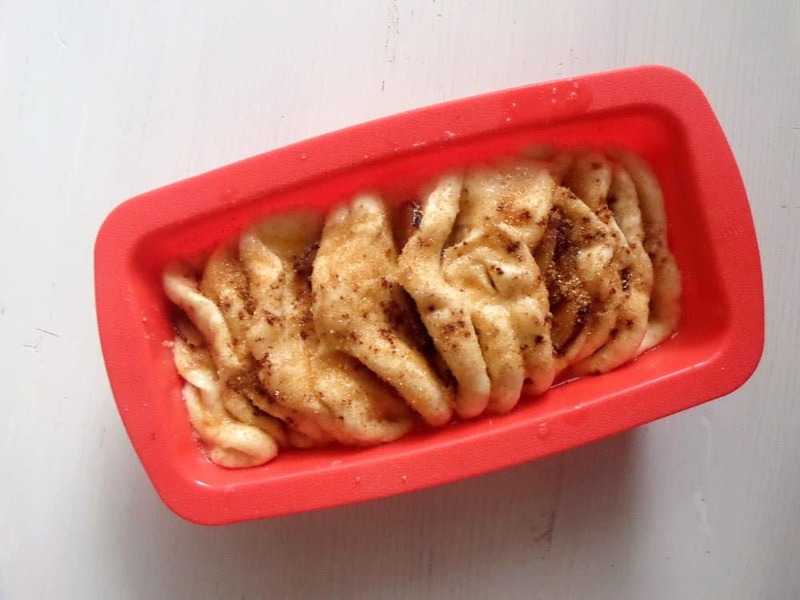 Your pull apart bread looks totally irresistible, Adina. I love the add of plum slices. Hi Adina – you’ve got some delicious eats here! : ) Love your pull-apart bread. I know what you mean…I often start with one purpose and before I know it, I see something that I just *have* to make! You pick a good challenge but it looks like you did beautifully. It looks so impressive and I can just picture the aroma and taste fresh from the oven! 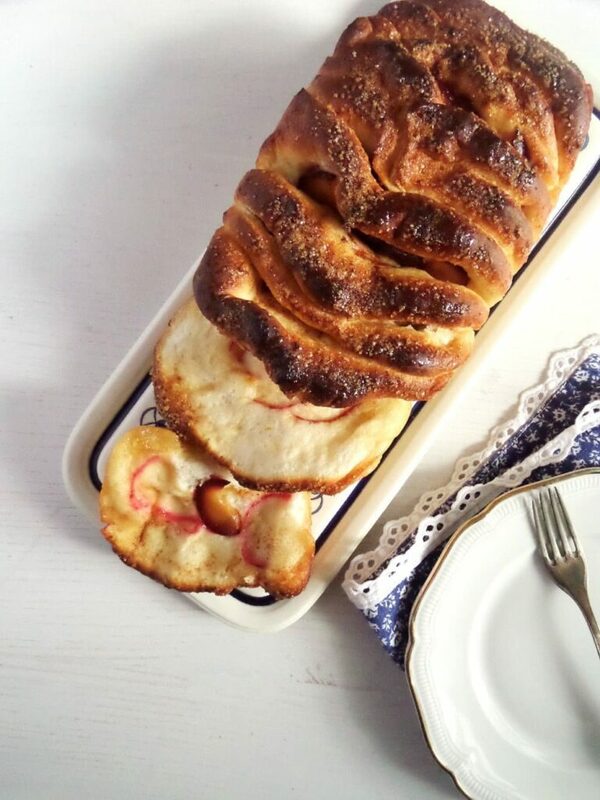 I love plums and I love pull apart bread. Fantastic recipe! Wow ! Looks so beautiful ! I’m sure I’ll love it. Hi. I am in the process of making this recipe and I see it calls for an egg in the ingredients but it is not used in the recipe. When is the egg added? Hi JJ. Sorry, I’ve only read the comment now. The egg comes in the dough, add it to the bowl before you start kneading.